Wyndham Collection WCV161672DCDCMUNRM24 - 72" Double Bathroom Vanity, White Carrera Marble Countertop, Undermount Oval Sinks, & 24" Mirrors. Wyndham Collection WCV161660DCLCMUNRM56 - 60" Double Bathroom Vanity, White Carrera Marble Countertop, Undermount Oval Sinks, & 56" Mirror. 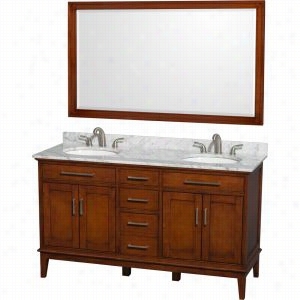 Wyndham Collection WCS211172DESIVUNOM24 - 72" Double Bathroom Vanity, Ivory Marble Countertop, Undermount Oval sinks, & 24" Mirrors. Wyndham Collection WCS211172DESIVUNOM70 - 72" Double Bathroom Vanity, Ivory Marble Countertop, Undermount Oval sinks, & 70" Mirror. Wyndham Collection WCS141472DESCMUNSM70 - 72" Double Bathroom Vanity, White Carrera Marble Countertop, Undermount Square Sinks, & 70" Mirror. Wyndham Collection WCV161660SCDCMUNRM44 - 60" Single Bathroom Vanity, White Carrera Marble Countertop, Undermount Oval Sink, & 44" Mirror. ACF by Nameeks ACF DA01-SO Dadila 24-in. 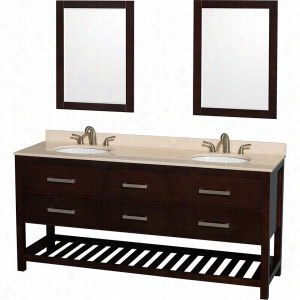 Single Bathroom Vanity Set. 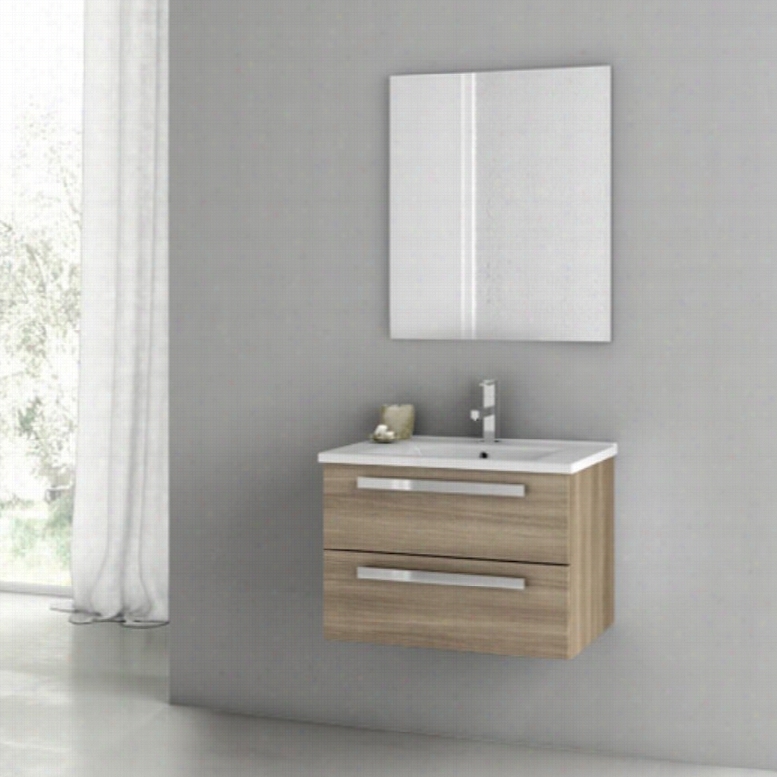 Modern wall-mounted vanity set. Engineered wood cabinet with metal pulls. Style Oak finish with polished chromed accents. 2 spacious drawers. Choice of faucet drill holes. Rectangular white ceramic sink bowl. 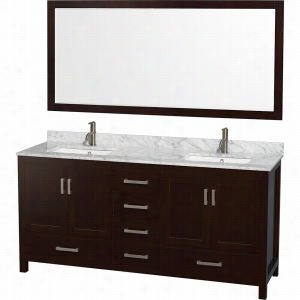 Includes wall-mounted vanity, fitted white ceramic sink, and mirror. Faucet not included. Turn your bathroom on its head with the ACF by Nameeks ACF DA01-SO Dadila 24-in. 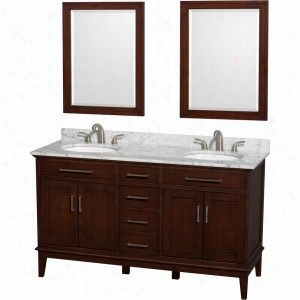 Single Bathroom Vanity Set - Style Oak and its forward-thinking design and style. 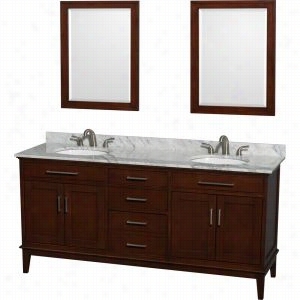 Complete with vanity, fitted white ceramic sink, and mirror, this three-piece set just needs your choice of faucet. Chrome hardware and the style oak finish of the vanity play perfectly to catch your eye. 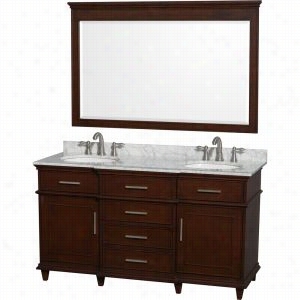 Mounting securely to your wall, the vanity has a unique floating effect.Component Dimensions:Vanity dimensions: 24.4W x 16.9D x 17.5H in.Mirror dimensions: 28.3W x 25.6H in.Fitted rectangular sink dimensions: 23.6W x 17.7D in.About NameeksFounded with the simple belief that the bath is the defining room of a Household, Nameeks strives to design a bath that shines with unique and creative qualities. Distributing only the finest European bathroom fixtures, Nameeks is a leading designer, developer, and marketer of innovative home products. In cooperation with top European manufacturers, their choice of designs has become extremely diversified. Their experience in the plumbing industry spans 30 years, and is now distributing their products throughout the world today. Dedicated to providing new trends and innovative bathroom products they offer their customers with long-term value in every product they purchase. In search of excellence, Nameeks will always be interested in two things: the quality of each product and the service provided to each customer. 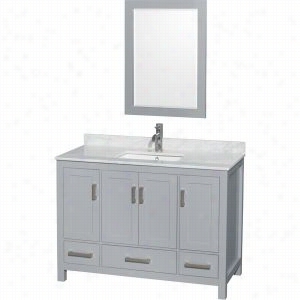 Wyndham Collection WCV161660DCDCMUNRM24 - 60" Double Bathroom Vanity, White Carrera Marble Countertop, Undermount Oval Sinks, & 24" Mirrors. 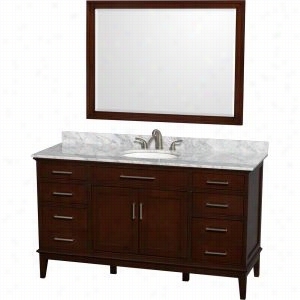 Wyndham Collection WCV171760DCDCMUNRM56 - 60" Double Bathroom Vanity in with White Carrera Marble Top with White Undermount Oval Sinks & 56" Mirror. Wyndham Collection WCS141448SGYCMUNSM24 - 48" Single Bathroom Vanity, White Carrera Marble Countertop, Undermount Square Sink, & 24" Mirror.